SYNOPSIS - Nicholai Hei is the world's most wanted man. Half German, half Russian, Hel was raised by a Japanese general and survived Hiroshima to become a mystic , a master of the senses, and the most deadly assassin in the world. Hel has left his past behind him to live a life of isolation in a remote mountain fortress, determined to attain a state of effortless perfection known as shibumi. Then Hannah Stern arrives at his door. EXCERPT - For the last seven hours, Hannah Stern had alternated between clawing through nightmare reality and floating upon escapist fantasy, between confusion and vertigo. She was stunned by emotional shock, spiritually evacuated. And now, teetering on the verge of nervous disintegration, she felt infinitely calm....even a little sleepy. FL Speaks - This is the kind of book I love. Other than fantasy ofcourse. Upon reading the synopsis, i expected this to be more on the lines of Jason Bourne or Colonel Jon Smith. But it was not to be so. This is not a political espionage i so wanted it to. Yes, there is the bumbling CIA. But the agents are portrayed as stupid. Anyway, Hel is the man you want to be. Good lucks, unlimited funds and a stage IV lover in bed. (whatever that is, sounds extremely awesome). Hel is raised in Japan and when they are bombed by the US of A, he realises that finding a job is extremely difficult as he is a citizen of no country. 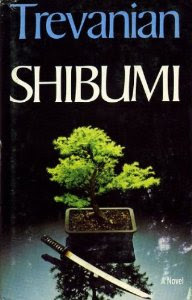 In constant search of Shibumi, the eternal perfection within, he is placed in the care of a certain respected Japanese man, who is a friend of the general who raised him since his mother passed away. Later he works for the Americans he hate (or rather, Americanism, as he says) and after a 3 year stint in a prison, he is released to the general public after making a hit for the CIA who busts him out of prison. The book is a to and fro narration of flashbacks. Trevanian manages an explosive start, but the initial excitement fizzes away when you realise that half the book is gone and there is still no plan as to how Hel (international assassin that he is) is going to help out the poor little, yet pretty Hannah Stern. Also, more than 100 pages are spent in trying to detail his and his friend's plight in a certain cave. (I get it. they like spelunkering. But 100 pages in a 488 page book is too much detail specially when the synopsis. Anyway, the pace does increase but you still don't find the dynamite ending you hope against hope. Nicholas Hel is a perfect killer. I admit that. He is just not the most interesting and exciting killer. Still, Hel is the benchmark on which other assassins are rated. Good read. Won't highly recommend if you already love Ludlum's style of writing. Yet, people new to espionage, should pick it up. not picking this one .. slow pace is ok with me .. but boring details .. big no !